I've never read any books by author Jocelyn Green before. Hearing about this book from Litfuse, I joined the blog tour so I'd have the opportunity to review the book. So thankful I did. Having not read books during the French occupation and settling of Louisiana, this really piqued my interest! 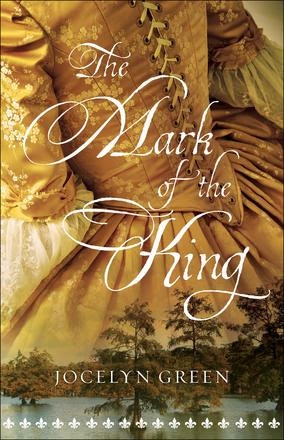 Summary: After being imprisoned and branded for the death of her client, twenty-five-year-old midwife Julianne Chevalier trades her life sentence for exile to the fledgling 1720s French colony of Louisiana, where she hopes to be reunited with her brother, serving there as a soldier. To make the journey, though, women must be married, and Julianne is forced to wed a fellow convict. I was thoroughly captivated by this book. As an avid fan of historical novels, this one did an amazing job of transporting me back to the settlement of Louisiana by the French. Honestly, I can't even tell you how little I know about that time in history. Reading Mark of the King gave me an amazing fictional insight to what life was probably like for those who were settling this new land. We get to know poor Julianne as she deals with one incident after another: thrown into prison, married to a man she doesn't know, and shipped off to a land that doesn't have enough resources to handle all of the people coming to it. I can only imagine what that must've been like for the people who actually had to endure such circumstances. Things sadly don't get any better once she arrives with her new husband. Things go from bad to worse. The mark Julianne received as a prisoner follows her everywhere she goes. The officer Marc-Paul Girard tries to help her navigate this new world she's ended up in. Of course, a story such as this has deceit, loss, and battles to be fought. The Native Americans were used by the French and British alike, and it rears its ugly head throughout the story. Julianne's brother, Benjamin, had been one of the officers who was sent to live with them to learn more about their ways. Unfortunately, Benjamin has been lost, the one last relative Julianne had. I couldn't get enough of this book. It's one of those stories that has you falling asleep and waking up wondering what's going on with the characters. About the Author: Jocelyn Green inspires faith and courage as the award-winning author of ten books to date, including Wedded to War, a Christy Award finalist in 2013; Widow of Gettysburg; Yankee in Atlanta; and The 5 Love Languages Military Edition, which she coauthored with bestselling author Dr. Gary Chapman. A former military wife herself, her passion for military families informs all of her writing as well as her numerous speaking opportunities. Jocelyn graduated from Taylor University with a BA in English and now lives with her husband and two children in Iowa. 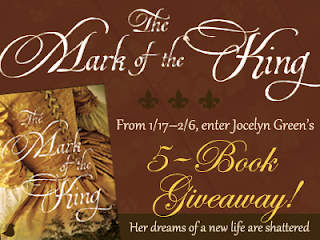 There are a few days left to enter the giveaway, so check that out by clicking the image below! What period of time do you enjoy reading about? I'm #2 in queue at the library! Mississippi magnolia scent is my favorite.